Starbucked: A Double Tall Tale of Caffeine, Commerce, and Culture will be the first book to explore the incredible rise of the Starbucks Corporation and the caffeine-crazy culture that fueled its success. Part Fast Food Nation, part Bobos in Paradise, STARBUCKED combines investigative heft with witty cultural observation in telling the story of how the coffeehouse movement changed our everyday lives, from our evolving neighborhoods and workplaces to the ways we shop, socialize, and self-medicate. In Starbucked: A Double Tall Tale of Caffeine, Commerce, and Culture , Taylor Clark provides an objective, meticulously reported look at the volatile issues like gentrification and fair trade that distress activists and coffee zealots alike. Through a cast of characters that includes coffee-wild hippies, business sharks, slackers, Hollywood trendsetters and more, STARBUCKED explores how America transformed into a nation of coffee gourmets in only a few years, how Starbucks manipulates psyches and social habits to snare loyal customers, and why many of the things we think we know about the coffee commodity chain are false. Nearly a century ago, mankind discovered the secrets of the perfect cup of coffee. In 1920, Prescott’s talents attracted the attention of the National Coffee Roasters Association, a group that had long been searching for a novel way to boost sluggish coffee sales. After bankrolling a string of ineffective publicity campaigns, the roasters decided it was time for a shift in tactics; coffee, they concluded, needed “a college education.” Thus inspired, they issued Prescott a challenge: their group would build and staff a state-of-the-art coffee research laboratory for him at MIT if he would devote himself to uncovering the scientifically exact principles for creating the ultimate coffee elixir. Prescott accepted the mission. Armed with the very latest in beaker and Bunsen burner technology, he set out to bring coffee’s Platonic ideal down to earth. So how exactly does one go about perfecting a beverage? Prescott’s answer to this was simple: you prepare it in every way you can possibly imagine and then have taste testers judge the results. At the lab, he and his staff played with all of the conceivable variables in the coffee-making process. They brewed it in pots made of copper, aluminum, nickel, glass, and many other materials; they dripped it, pressed it, and percolated it; they toyed endlessly with temperatures, grinds, and steeping times. Almost every day, Prescott would appear in MIT’s main cafeteria bearing a tray loaded with cream, sugar, and two beakers of experimental coffee to try out on his crack “tasting squad” — fifteen people with expert, discriminating palates (that is, women from around campus). For three years, he watched them take their thoughtful sips, tallied their preferences, and adjusted his brewing accordingly. Use one tablespoon of freshly ground coffee for every eight ounces of water. Force these grounds through water that is a few degrees short of boiling, inside a glass or earthenware container. Never, ever boil or reheat coffee, and never reuse the grounds. That was it, the culmination of years of painstaking research. Brewing the coffee of the gods was almost as easy as making toast. Anyone could do it. The elated roasters rushed to publicize the results in hundreds of newspapers and magazines, while the triumphant Prescott went on to try his hand at creating the optimal banana, ice cream, candy, milk, and cow. His guidelines for “the ideal cup of coffee” reached nearly forty million readers — and, incidentally, the formula still holds true today. So it’s not like we didn’t know how to make coffee. We knew. And thus, it’s truly a testament to the indomitable American spirit that we managed to violate every shred of Prescott’s advice for the next fifty years. We boiled countless pots of coffee into oblivion on stove-top percolators. We sat idly by as diner waitresses in hairnets poured us cups of mysterious brown sludge that could easily have been used as industrial paint thinner. Grim-faced, we downed concoctions that made us want to scour our tongues with sandpaper, having resigned ourselves to a fate of acrid and generally awful coffee. By the 1960s, the only true devotees of the brew left standing were truck drivers, traveling salesmen, and, well, old people. With this crowd representing the bleeding edge of coffee connoisseurship, it was no surprise that the American coffee habit soon plummeted to a historic nadir. “I was born in 1945, and none of my buddies drank coffee,” said Donald Schoenholt, who runs the Brooklyn-based Gillies Coffee Company, America’s oldest roaster. “My friends would grab a Coke and have a cigarette in the morning because coffee tasted terrible! People would just run the tap water as hot as it could go, put a teaspoon of instant coffee in the cup, and shake it up.” The situation grew so dire in the sixties that Schoenholt’s father even tried to convince his seventeen-year-old son not to go into the family business — then in its 122nd year of operation — because he feared the avalanche of terrible coffee would utterly destroy the public’s taste for decent beans. For many bitter years, coffee languished in beverage purgatory. A number of females — some say a hundred, some say more — assembled with a cart and trunk, marched down to the warehouse and demanded the keys [from the merchant]. 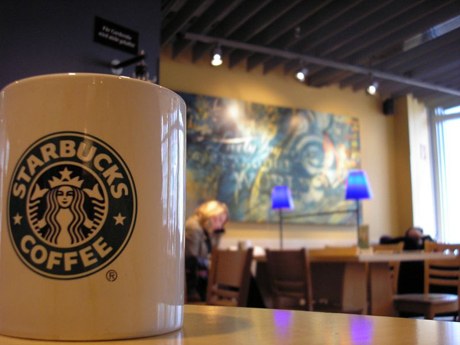 Read about the book Starbucked: A Double Tall Tale of Caffeine, Commerce and Culture by Taylor Clark, which explores the incredible rise of the Starbucks Corporation and the caffeine-crazy culture that fueled its success.